Alexandre Lacazette was sent off as Arsenal slumped to a disappointing first-leg defeat against Bate Borisov in the Europa League last 32. Stanislav Dragun nodded home Igor Stasevich's free-kick for the game's only goal just before half-time. Lacazette had a goal disallowed early in the second half before being sent off for elbowing Aleksandar Filipovic. A resolute Bate held on for the win, their first over an English side at home in European competition. The Belarusian champions will now take a slender lead to Emirates Stadium for the second leg next Thursday. Aliaksei Baga's side were playing their first competitive match since December and doggedly held on to their lead in the second half. Arsenal, in contrast, managed just three shots on target despite enjoying nearly 77% possession. Unai Emery will have hoped the resumption of the Europa League would have given his side some momentum after an inconsistent few weeks. The Gunners' final Europa League group game against FK Qarabag in December extended their unbeaten run in all competitions to 22 games. But since then Emery's side have lost six out of 13 matches, going out of both domestic cups in the process. Emery responded to that patchy form by naming a strong side for the game in Belarus, showing just two changes from the team that won at Huddersfield last weekend. There was early promise as Henrikh Mkhitaryan drew a smart stop from Denis Scherbitski within 90 seconds. Further chances for Lacazette and Alex Iwobi followed, but the Gunners quickly deteriorated. Bate Borisov, meanwhile, are effectively in pre-season having not have not played a competitive game since their final Europa League group match two months ago. They showed little sign of rustiness, however, and grew in confidence as the game progressed, cheered on by a boisterous home crowd. Most of their attacking play went through captain Stasevich, who delivered more assists than any other player during the group stages. Bate debutant Nemanja Milic had already clipped the post from Stasevich's drilled cross before the midfielder laid on the opening goal from a set-piece. His free-kick from the right found the head of Dragun, who had evaded marker Sead Kolasinac and powered a header beyond Petr Cech. Even the second-half introduction of top scorer Pierre-Emerick Aubameyang and January signing Denis Suarez failed to spark a response from Arsenal, who suffered a fifth defeat in eight away games in all competitions. Their misery was compounded when Lacazette needlessly lashed out at Filipovic and was deservedly sent off, with the French striker later apologising to supporters on Twitter. The Gunners will still feel confident of having enough in next week's second leg to progress, but they have made their task considerably harder than it might otherwise have been. Arsenal head coach Unai Emery: "Next week we are going to play another 90 minutes and I am sure it is going to be different. Today the first half was a good performance for us, we had chances to score, sometimes last week our chances brought a goal and today they did not. "We worked. I am happy with the players as we worked and we tried. They struggled also defensively when they were 1-0 up - and they are organised and a competitive team. "Our big chance, our big opportunity and challenge is next week. I trust in our players and I trust in our stadium and supporters." On Lacazette's red card: "I didn't see the action but we spoke and frustration needs controlling. It's bad news with the red card. Next week we aren't going to play with him but now we are going to think with the players that are OK for next week." Arsenal have lost three of their past four away games in all competitions (W1), as many defeats as they had in their first 14 under Unai Emery (W8 D3 L3). Arsenal are just the second English team to suffer defeat against an opponent from Belarus in European competition, after Everton in December 2009 (1-0 v Bate Borisov in the Europa League). Arsenal have been eliminated from each of their past six two-legged ties in European competition when losing the first leg - the last such tie they managed to reverse was against FC Porto in the Champions League in 2009-10 (6-2 on aggregate). 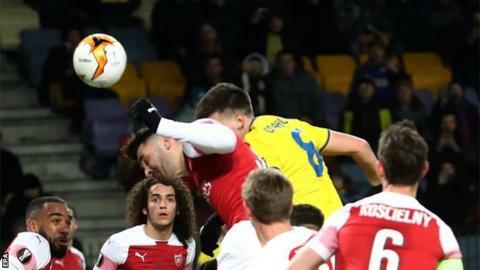 Stanislav Dragun's headed opener for Bate Borisov was the first goal Arsenal have conceded in the Europa League since matchday one against Vorskla Poltava, ending a run of five games and 495 minutes. Arsenal have kept two clean sheets in their past 14 games in all competitions, with their last one away from home coming at the start of January (3-0 v Blackpool in the FA Cup). Alexandre Lacazette's red card was the first shown to an Arsenal player in European competition since March 2017, when Laurent Koscielny was dismissed against Bayern Munich in the Champions League. Arsenal meet Bate again for the second leg at Emirates Stadium next Thursday (17:55 GMT) before returning to Premier League duty at home to Southampton on Sunday, 24 February (14:05 GMT). Match ends, BATE Borisov 1, Arsenal 0. Second Half ends, BATE Borisov 1, Arsenal 0. Attempt saved. Matteo Guendouzi (Arsenal) right footed shot from outside the box is saved in the bottom left corner. Assisted by Pierre-Emerick Aubameyang. Bojan Dubajic (BATE Borisov) wins a free kick in the defensive half. Attempt missed. Lucas Torreira (Arsenal) right footed shot from outside the box misses to the right. Assisted by Denis Suárez. Foul by Denis Suárez (Arsenal). Hervaine Moukam (BATE Borisov) wins a free kick in the defensive half. Stanislav Dragun (BATE Borisov) is shown the yellow card for a bad foul. Corner, Arsenal. Conceded by Stanislav Dragun. Aleksandar Filipovic (BATE Borisov) is shown the yellow card for a bad foul. Alexandre Lacazette (Arsenal) is shown the red card for violent conduct. Foul by Aleksandar Filipovic (BATE Borisov). Foul by Hervaine Moukam (BATE Borisov). Corner, Arsenal. Conceded by Aleksey Rios. Corner, Arsenal. Conceded by Aleksandar Filipovic. Maksim Skavysh (BATE Borisov) wins a free kick in the defensive half. Corner, Arsenal. Conceded by Denis Scherbitski. Foul by Bojan Dubajic (BATE Borisov). Attempt blocked. Evgeni Berezkin (BATE Borisov) right footed shot from outside the box is blocked. Assisted by Maksim Skavysh. Substitution, Arsenal. Denis Suárez replaces Sead Kolasinac. Attempt missed. Sead Kolasinac (Arsenal) left footed shot from a difficult angle on the left misses to the right. Bojan Dubajic (BATE Borisov) is shown the yellow card for a bad foul. Substitution, BATE Borisov. Bojan Dubajic replaces Nemanja Milic. Substitution, Arsenal. Pierre-Emerick Aubameyang replaces Ainsley Maitland-Niles.